Here is a fun giveaway that you will definitely not want to miss. Enter to win in the American Girl of the Year Giveaway before it’s too late. Good luck! About American Girl: At American Girl, they celebrate girls and all that they can be. That’s why they develop products and experiences that help girls grow up in a wholesome way, while encouraging them to enjoy girlhood through fun and enchanting play. About “Girl of the Year”: The Girl of the Year contemporary 18-inch doll line is designed to reflect the various interests, issues, and concerns facing real girls today. About Blaire: The 2019 Girl of the Year! She’s a chef-in-training, party planner, and chicken wrangler at her family’s farm and restaurant. Blaire does it all at her family’s restaurant, inn, and farm. In the first book of her series, her recent food sensitivity has made her time in the kitchen – and time with friends – a little tough. But now she has the perfect distraction: a wedding to plan! With her BFF by her side, and a million creative ideas saved on her tablet, Blaire is sure she can make the farm’s first wedding an epic celebration. But between dress disasters, texting mix-ups, and more than one incident with a mischievous goat, Blaire soon learns that wedding planning is a tricky business…and that balancing friendships is even trickier. Can Blaire find a way to make things right, or will this wedding, and her friendship, turn into epic fails? 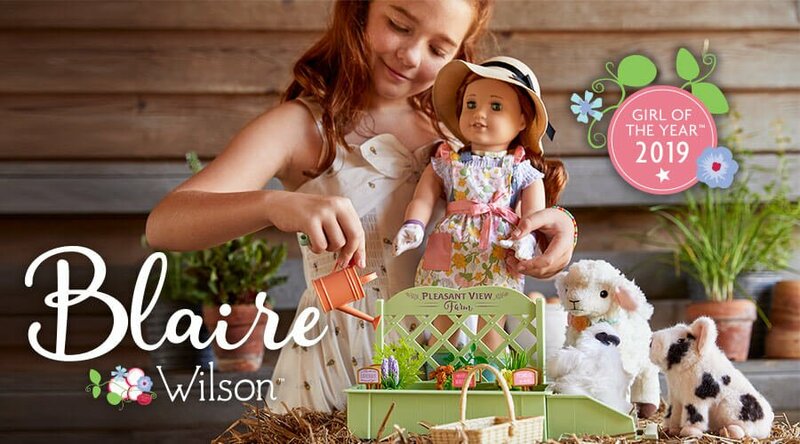 One VERY LUCKY Nanny to Mommy reader will win American Girl 2019 Girl of the Year Blaire Doll, Book & Accessories, RV $119. Entry is simple, just follow the prompts on the Rafflecopter below. Open US only, must be 18+ to enter. Winner chosen via Random.org through Rafflecopter. All winning entries are verified. Please follow us on Facebook to stay up to date with our current giveaways. Check out other featured products in our Gift Guides and Good luck! Nanny to Mommy received complimentary products to provide this review. All opinions are her own. Nanny to Mommy or participating bloggers are NOT responsible for prize fulfillment. This giveaway is open US only, must be 18+ to enter. One entry per household/IP address. No social media was involved in this giveaway in any way. Winner is chosen via Random.org through Rafflecopter. ALL winning entries ARE verified. Winner will have 48 hours to respond with all information in email or another winner will be chosen.